﻿A perusal of string quintets throughout history leaves one with the impression that their creators wish to bestow a powerful impact upon the small group of musicians. 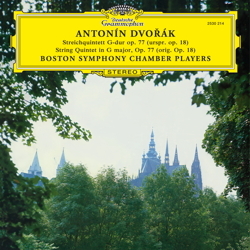 And it is no different with Dvořák’s Quintet in G major: a double bass, instead of the usual second cello, paints with broad strokes in the lengthy score whose first movement almost takes on symphonic dimensions. Here, the insistent, broad theme is presented in snappy cascades of sound. The cantilena, supported by a scurrying second subject, is followed by a frenzied Scherzo, which is steeped in Czech folk music under Dvořák’s distinctive style. The third movement (Poco andante) is highly meditative and is constructed with layers of one and the same basic motif, which soon is intensified with pulsating quavers and finally evolves in rising melodic elements. The Finale is filled with fresh melodies and spiced with subtle motivic development, which is pleasant on the ear in all its complexity. It is not surprising, therefore, that Dvořák won an important prize for his Quintet.